Back in 2012, Facebook COO Sheryl Sandberg remarked that Facebook delivers an audience three times as large as the Super Bowl, and it happens every day. That was when Facebook had “only” one billion users. Today, that number exceeds 1.4 billion, making the company’s lead over the US’s marquee sporting event even greater. Mobile is grabbing an enormous share of digital video. YouTube now claims that half of its video views happen on mobile devices. Facebook recently reported that more than 4 billion video views happen on the network every single day. YouTube and Facebook may be the biggest, but they aren’t the only ones attracting a mobile audience. According to eMarketer, adults watch nearly 40 minutes of video on their mobile devices every day. Based on the viewing habits of my kids, I bet that number is even bigger among children. All this means you can put video in the same category as email, shopping, and anything else we may do digitally: half of it happens on a mobile device. In spite of that, advertisers haven’t kept pace. 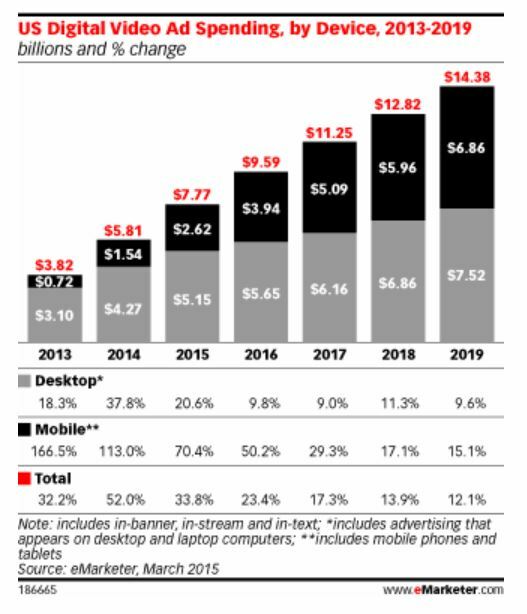 As the nearby chart illustrates, desktop digital video attracts nearly three times as many ad dollars as mobile. This not the first time I’ve flagged gaps between the things consumers do with their mobile devices and how much advertisers spend to reach those consumers. Unlike other forms of advertising, though, mobile video may require the least amount of incremental effort. That’s why it’s a such a natural on-ramp to mobile marketing. Advertisers will find an abundance of advice online about how to create compelling video for a video audience. (I wrote about it last year for Skyword, a content marketing agency.) Without repeating the best of that guidance here, I will say that many of the characteristics of compelling TV advertising apply just as much to mobile. In other words, if you’re good at making TV ads, you’re probably going to be great at mobile video advertising, too. That’s not the case with most other forms of mobile advertising, which tend to have pretty unique qualities and requirements. At the risk of relying upon generalizations, my advice to anyone looking to reach and engage an audience under the age of 30 is to invest in video advertising on platforms that offer you the targeting, call-to-action, and measurement you need to achieve your return on marketing investment. Facebook and YouTube tend to offer the highest quality inventory, and you should expect to pay accordingly. On the other hand, the fact that so few advertisers are spending here suggests that we may look back on today’s video ad prices and see them as a bargain. ← Is The Mobile Advertising Market Too Small Or Just Right? The Answer Is….